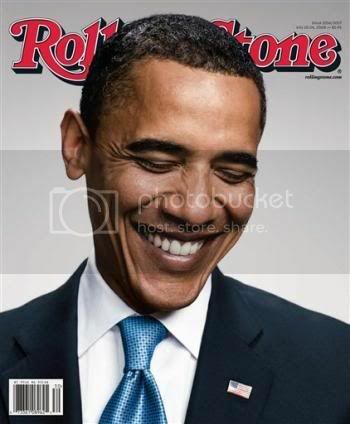 Barack Obama's Cover on Rolling Stone. 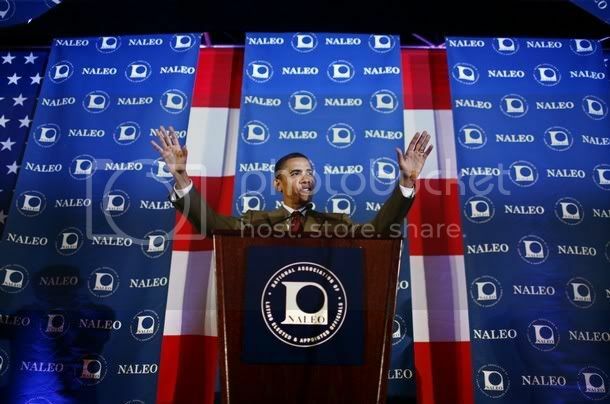 The highlight today are the speeches of Obama and McCain at the NALEO Latino Leadership Conference. Below video of heckler during McCain speech. To view the full video of McCain, click here. To view the full video of Obama, click here. Via C-Span. 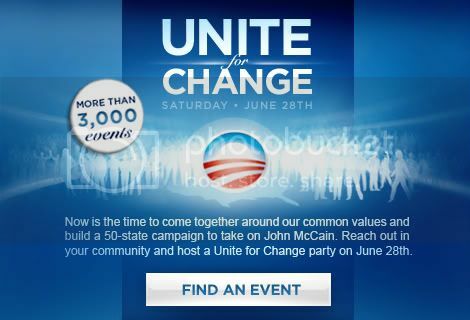 I am going to a Unite for Change meeting later in my neighborhood, are you? There are over 4,000 parties/get togethers nationwide setup, don't wait find one and join us. Or is unity asking too much? I know this is supposed to be a marriage, but behind the scenes, it feels more like a divorce. There's a lot of sadness and hurt between the Barack Obama and Hillary Clinton camps, with both sides fighting over money and loyalty. Before the unity fest to began here in Unity, N.H., I was on the phone with some top Clinton supporters who attended a big gathering of major donors in Washington, D.C. last night. It was hosted by Clinton's team, and to many in attendance, it didn't feel like a reunion. It felt like the arrival of a repo man. "Hillary was sad, even pitiful I have to say," said one of her top donors. "It was like, this guy is coming to take my family away." But most of the right things were said. And folks mad that McCain is taking Saturdays and Sundays off???? The Obamas maxed out to Hillary and the Clintons max out to Obama. The first thing I notice about the plane is how low-key it is, all coach seating from back (the press) to front (the candidate). There is no separate compartment for this potential president; he just holds down the second row for himself and his newspapers. There are no more than 10 staffers on the plane, and a dozen or more rows are empty, separating the senator from the Secret Service contingent and two dozen members of the traveling press corps. It's not a big day or a big event: The primaries are done, and none of the media big names are along. The thing that is remarkable is that for a politician, Obama has graced the Rolling Stone cover twice within a year, but this time NO TYPE over the picture, just him. Audio Clips from the Jann Wenner interview with Barack, here. What is on his ipod? This video is from Senator Gordon Smith (R-OR), yes riding on Obama's coattails in Oregon. As Al G. from The Field has said, "this is a once in a lifetime election." It has been a long time since I have seen somthing like this, but the Obama Campaign has set the record STRAIGHT. "Barack Obama has a long record of bipartisan accomplishment and we appreciate that it is respected by his Democratic and Republican colleagues in the Senate. But in this race, Oregonians should know that Barack Obama supports Jeff Merkley for Senate. 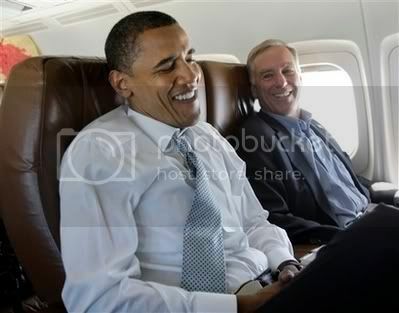 Merkley will help Obama bring about the fundamental change we need in Washington," said Obama campaign spokesman Bill Burton. I guess Gordon Smith knows which way the wind is blowing and it is for Obama, at least in his state. 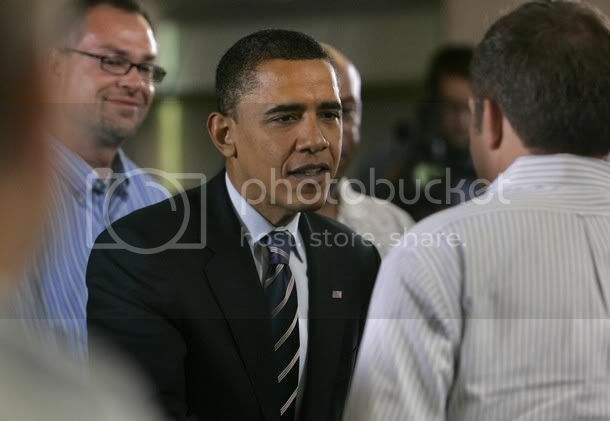 Obama, look forward to you cutting an ad for Merkley, soon. Barack Obama was in Hollywood, yesterday and walked away 5M richer. Since, Obama is NOT accepting public financing for this election, expect more fundraisers from the Obamas. And the Clinton supporters will/are coming home. "In the primary, you fight hard and then you have to come together," said producer Lawrence Bender, one of Obama's early Hollywood supporters. "This was a real unifying event." "The Hillary supporters may have blustered a little, but they're not going to vote for McCain," said actress and writer Heather Thomas, who attended the event with her husband, entertainment lawyer Skip Brittenham. "There's no way." Political strategist Chad Griffin, a Clinton fundraiser, said: "There were many people in the room tonight who supported other candidates in the primary. But everyone was unified with the goal of defeating John McCain." Among the celebrities in attendance were actors Dennis Quaid, Samuel L. Jackson, Don Cheadle, retired boxer Sugar Ray Leonard and Jennifer Beals. Also there were former Paramount Pictures chief Sherry Lansing and her husband, director William Friedkin; "Lost" producer J.J. Abrams and his wife, Katie McGrath; producer Mike Medavoy and his wife, Irena, an early Obama supporter; and Motown greats Berry Gordy and Clarence Avant, both former Clinton supporters. Quaid introduced Seal. "He's here tonight to sing for the superman for everyone -- Barack Obama," Quaid told the crowd. "At last, someone has come along that is restoring my faith," Seal told the crowd. Yep, it is time for us to come together as Democrats, united. California Atty. Gen. Jerry Brown told reporters outside that Obama had spoken earlier to about 300 people, including some prominent Clinton supporters. Among them, Brown said, were Los Angeles Mayor Antonio Villaraigosa, who led Clinton's efforts to court Latino voters, and John Emerson, a White House aide to President Clinton and one of Hillary Clinton's biggest California fundraisers. Cheadle, who was watching from the balcony, said of Obama: "He's my candidate, and I think you have to put your money where your mouth is." Also watching from the balcony was will.i.am, producer of the popular online "Yes We Can" video tribute to Obama. He was dressed in a white suit. 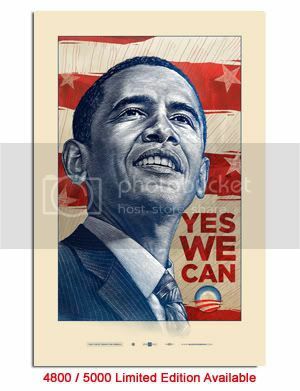 Obama, he said, made it "over the hill" by winning the Democratic nomination. "Now we're in a valley, and we got a bigger hill to climb." 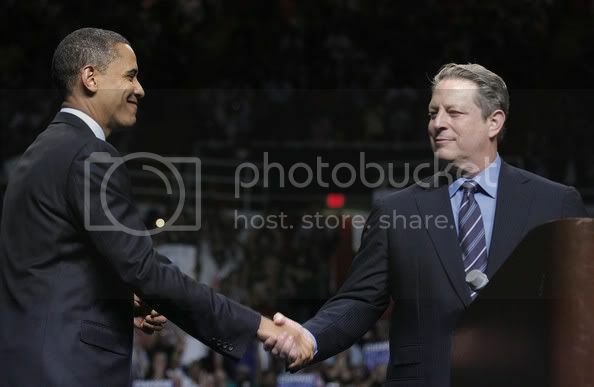 For his part, Obama recognized that the gathering included many Clinton supporters. The months of primaries and caucuses, he said, "I know caused some heartburn and some frustration." Obama added that he and Clinton "were allies then and we're allies now." Make sure you donate to the Obama Campaign, the donation widget to the left. No one cared much about Unity — the town or the ideal — back when more than a dozen candidates were competing in the New Hampshire primary. "We've had state senators and congressmen and people like that who've walked in our Old Home Day parade when they were campaigning, but I don't remember having any presidential candidates here in my time," said Roberta Callum, who has lived in the tiny western New Hampshire town for all but 12 of her 84 years. Barack Obama will focus his resources largely in 14 states George W. Bush won in 2004, his chief field operative said Tuesday, hoping to score upsets in places like Virginia, Indiana, and Georgia. But winning the White House won’t be his only goal, deputy campaign manager Hildebrand told Politico: In an unusual move, Obama’s campaign will also devote some resources to states it’s unlikely to win, with the goal of influencing specific local contests in places like Texas and Wyoming. Texas Democrats are five seats away in each chamber from control of the state legislature, which will redraw congressional districts after the 2010 census. In Wyoming, Democrat Gary Trauner, running for the state’s sole congressional seat, lost narrowly against an incumbent in 2006 and is now seeking an open seat. And if you have not watched this "rip off" video of Barack Obama, sit back, watch and laugh....really that is about all you can do. The LA Times/Bloomberg Poll has shut many UP. How is that? Well, many of the cable desk clerks were chirping away that the Newsweek Poll was a outlier. I remember distinctly that Howard Fineman of Newsweek made a statement that "the Newsweek Poll has a distinct way of showing movement..." Well, Mr. Fineman was not wrong. The LA Times/Bloomberg Poll has just confirmed the movement. In a two-man race between the major party candidates, registered voters chose Obama over McCain by 49% to 37% in the national poll conducted last weekend. But not so fast. The numbers for Obama improves to +15 if you mix in Bob Barr and Ralph Nader. I see Barr a problem for the Republicans this cycle, as Ross Perot was for the Republicans in 1992. On a four-man ballot including independent candidate Ralph Nader and Libertarian Bob Barr, voters chose Obama over McCain by an even larger margin, 48% to 33%. 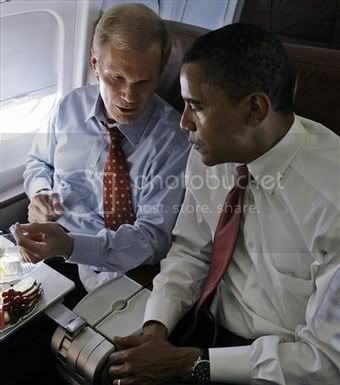 And what has catapulted Obama over McCain? The economy, period. I can not type this enough, and I hope my brother in far away St. Paul, Minnesota reads this, as he is skeptical Obama can win in November. When we are approaching five dollar gas, jobs are being lost with no new ones created, food prices soaring and yes, look at the flooding, none of the goods are moving in this country, kids are not able to afford college, the environment needs to be addressed, the Iraq War is sucking this country dry, infrastructure in this country can not be trusted, will you vote Republican in November to continue this? This election cycle is about our pocketbooks and in the end who gives a ratsass what color a person is? In the end, you want who did this to you OUT OF OFFICE and that is the Republicans. But the great majority of Clinton voters have transferred their allegiance to Obama, the poll found. Only 11% of Clinton voters have defected to McCain. McCain is not capturing the full extent of the conservative base the way President Bush did in 2000 and 2004," said Susan Pinkus, director of the Times Poll. "Among conservatives, evangelicals and voters who identify themselves as part of the religious right, he is polling less than 60%. Meanwhile, Obama is doing well among a broad range of voters," she said. "He's running ahead among women, black voters and other minorities. He's running roughly even among white voters and independents. This is good news, but we got 4 months to go, we still need to work like we are 20 points down, because we all know that that negative advertising is coming and expect that heavy in October. In the meantime, yes, be happy. Obama Campaign will help her pay off her vendor debt, NOT HER PERSONAL LOAN DEBT, and Hillary has indicated herself, only the vendor debt, not her personal debt. Story is here. Sen. Barack Obama's gala fund-raiser today will attract the mandatory lineup of big-screen talent and boldface names - actors Samuel L. Jackson and Dennis Quaid, model Cindy Crawford and boxing legend Sugar Ray Leonard - and reconfirm that the entertainment industry remains one of the most reliable and abundant sources of Democratic campaign cash. 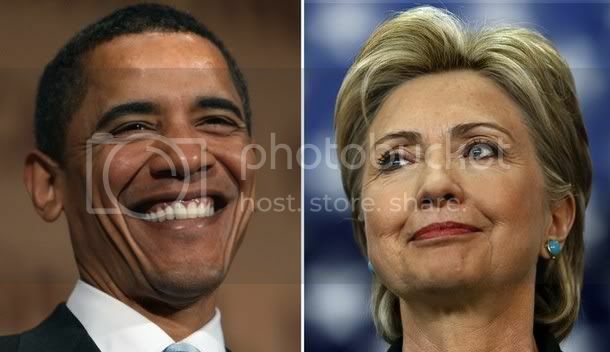 The party's 2008 presidential contenders pocketed $8 of every $10 coming from movie, TV and music businesses, and Sen. Hillary Clinton's withdrawal from the race all but guarantees a Hollywood windfall for Obama as the party begins to unite around its presumed nominee. The glitzy gathering will be an early test of the Illinois Democrat's ability to enlist Clinton's financial backers, many of whom are still nursing some pain from the grueling primary contest. Obama is to meet with Clinton and her top fund-raisers Thursday in Washington and the two are to campaign together for the first time on Friday in New Hampshire. The two will stage their show of unity in the small town of Unity. Well everyone is talking about McCain's senior advisor, Charlie Black and his total admittance of stating that another terror attack will help McCain. Why is this not surprising to me? I mean, what else do the Republicans have to offer? They have totally messed this country up, with the exception of the ultra rich in this country so bad that their own constituents don't want them back. Yeah, Republicans are hurting in this country, too. Black is just being, well, honest. Something that most politicians have an issue with. Remember when the Bush Administration released that Osama bin Laden tape the weekend before the election in November, 2004? It was that tape that pushed many undecideds into Bush's column. This is 2008. Different game now. The Bush Administration has been exposed for liars and frauds, from everything of handling Katrina, the Iraq War, the Plame debacle, the US Attorney mess, and the list is endless. Charlie Black should not have stated what he did, which is true in Republican circles, but he said it and we will just see what happens. President George W. Bush and his sterotyping. PRESIDENT BUSH: And the chef is a great person and a really good cook, by the way, Madam President. Yes, that was said. Transcript is here. Obama: Dobson "Making Stuff Up"
Barack Obama said Tuesday evangelical leader James Dobson was "making stuff up" when he accused the presumed Democratic presidential nominee of distorting the Bible. Dobson used his Focus on the Family radio program to highlight excerpts of a speech Obama gave in June 2006 to the liberal Christian group Call to Renewal. Speaking to reporters on his campaign plane before landing in Los Angeles, Obama said the speech made the argument that people of faith, like himself, "try to translate some of our concerns in a universal language so that we can have an open and vigorous debate rather than having religion divide us." and Karl Rove got nerve...Obama at a Country Club????? So how was your day????? 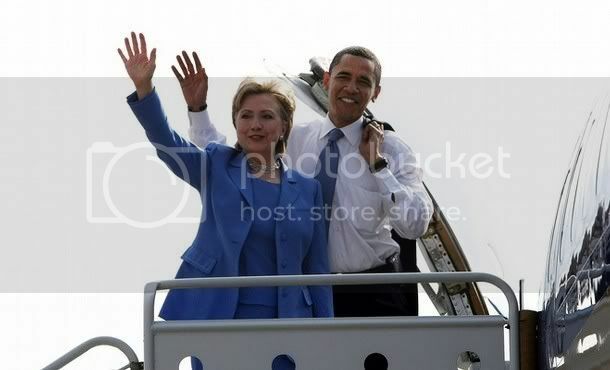 Well, rumor is that Obama and Clinton will be campaigning Friday in Pennsylvania. Stay Tuned. Ooopsy....they will be in Unity, New Hampshire. That is if he is president. The presumed Republican nominee is proposing a $300 million government prize to whoever can develop an automobile battery that far surpasses existing technology. The bounty would equate to $1 for every man, woman and child in the country, "a small price to pay for helping to break the back of our oil dependency," McCain said in remarks prepared for delivery Monday at Fresno State University in California. McCain said such a device should deliver power at 30 percent of current costs and have "the size, capacity, cost and power to leapfrog the commercially available plug-in hybrids or electric cars." The Arizona senator is also proposing stiffer fines for automakers who skirt existing fuel-efficiency standards, as well as incentives to increase use of domestic and foreign alcohol-based fuels such as ethanol. In addition, a so-called Clean Car Challenge would provide U.S. automakers with a $5,000 tax credit for every zero-carbon emissions car they develop and sell. Moveon.org putting Obama on the hot spot. It does, however, grant retroactive immunity, and I will work in the Senate to remove this provision so that we can seek full accountability for past offenses. This is all about making the telecom community RESPONSIBLE for the illegal spying program of the Bush Administration. This is going to be a stickler, here. My take, they should get NO IMMUNITY, period. Moveon will put the pressure on Obama. Now we will see what happens. Read it here. When VeraSun Energy inaugurated a new ethanol processing plant last summer in Charles City, Iowa, some of that industry’s most prominent boosters showed up. Leaders of the National Corn Growers Association and the Renewable Fuels Association, for instance, came to help cut the ribbon — and so did Senator Barack Obama . Then running far behind Senator Hillary Rodham Clinton in name recognition and in the polls, Mr. Obama was in the midst of a campaign swing through the state where he would eventually register his first caucus victory. And as befits a senator from Illinois, the country’s second largest corn-producing state, he delivered a ringing endorsement of ethanol as an alternative fuel. I agree with this. How? Well, it costs money to cover wars, period. Name the correspondent from the major networks over there? More importantly, how many are over there? The next president will have major, huge problems. Many not seen or recognized by the general public. Iraq is worse than many of us can imagine, but the failure of the mainstream media to cover it only tells you what the importance is. MONEY. It costs to cover this war, just as it cost money to cover this presidential race, which is easier because it is on our soil. Iraq is worse than is being reported, don't believe anything different. Obama is reintroducing himself to the country. As he must. Remember, we know the Obamas, most of the country does not. And if they know anything is just clips of Reverend Wright, if they were paying attention. Having this money to fund your own campaign allows you to define yourself, positions, family to the voters. Don't think the McCain Campaign is not worried about this, they are. In the opening weeks of the general-election campaign, Sen. Barack Obama has moved aggressively to shape his campaign and offered a clear road map for the kind of candidate he is likely to become in the months ahead: an ambitious gamer of the electoral map, a ruthless fundraiser and a scrupulous manager of his own biography in the face of persistent concerns about how he is perceived. Obama's early maneuvers suggest a clear understanding within the campaign of his strengths and weaknesses. He bought air time in 18 states, a sure sign that he hopes to expand Democrats' traditional electoral map. He opted out of the public campaign-financing system -- revealing his determination to press his financial advantage, even at the cost of handing his Republican opponent the opportunity to raise questions about the sincerity of his rhetoric on reform. And if you missed 'This Week With Barack Obama' read it here. Also read kos's state of the race, interesting, here. Finally, donate 30.00 and get this cool organic Obama T-Shirt, here. This was part of a statement that Barack Obama made to the United States Conference of Mayors in Miami, Florida. It was ironic that John McCain chose to visit Iowa, when the Governor of Iowa asked him not to. "I know that Sen. McCain felt as strongly as I did," Obama said, "feeling enormous sympathy for the victims of the recent flooding. I'm sure they appreciated the sentiment, but they probably would have appreciated it even more if Sen. McCain hadn't opposed legislation to fund levees and flood control programs, which he considers pork." This is politics folks. Pure and simple. McCain voted against this bill that would have sent federal dollars for restoration of dams and levees. Maybe, McCain forgot that he did not vote to fund this bill, but showed up for the photo-op anyway. The bill funded hundreds of projects — such as dams, sewage plants and beach restoration — that are important to local communities and their representatives. It also included money for the hurricane-hit Gulf Coast and for Florida Everglades restoration efforts. I don't know about you, but I am tired of this government not spending the appropriate money for something called, maintenance and repair on the infrastructure of this country. Ask these folks flooded out how they feel about it, or the folks in Minnesota when a bridge just up and collasped on them, or Katrina victims STILL trying to get their lives back in order. This country sure knows how to send money to Iraq in a snap, but for just the ordinary things like maintenance and repair, the Bush Administration will call it pork barrel spending in a minute, with McCain going right along with Bush. Senator Barack Obama is drawing up plans for extensive advertising and voter-turnout drives across the nation, hoping to capitalize on his expected fund-raising advantage over Senator John McCain to force Republicans to compete in states they have not had to defend in decades. With his decision to give up public financing and the spending limits that go with it, Mr. Obama has added several seasoned hands to his advertising team, a harbinger of a multifaceted television campaign that people inside and outside Obama headquarters said would grow well beyond its already large presence in 18 states. Future commercials could run on big national showcases like the Olympics in August and smaller cable networks like MTV and Black Entertainment Television that appeal to specific demographic and interest groups. Barack Obama opted out of public financing. A first for any major candidate. This decision is important on many levels. First, there will be grumbling from the other side of flip/flopping and Barack did, but for a good cause, to run a campaign independent of the shackles on your feet with public financing. I don’t expect this to stick because most of the general public is not interested in how campaigns are financed. They just don’t care. Maybe in another year or years to come, but not this year with the economy crumbling and gas prices looking at folks to hit five dollars a gallon, soon, it is a non-issue. But what this does mean? It means that not only is Barack independent, but the Democratic Party, as a whole, is independent. We are free to raise the amount of money needed to fund all 50 states through November, along with helping to raise money for all the congressional and senate races riding this independent wave, as well. I hope you fully understand what is at stake here. While some are complaining about FISA, we need to raise massive amounts of money for Barack, the DNC Convention, and the whole Democratic Party. This burden is not only on Barack, but all of us. Along with this, Barack and Michelle Obama must fundraise, Barack has to go overseas, Barack has to go to Iraq and Afghanistan, Barack has to run the Democratic Convention, Barack has to complete a platform, all in about two months. One word, "Wow." 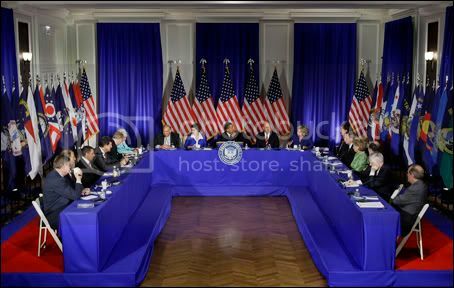 A good friend told me today that she did not like that Barack only raised 22M for May, for her a huge drop off. That is worrisome to her. I told her it did not bother me, but now I have to sit back and look at all I just wrote above and completely state, “this is a lot of stuff to complete on a promise of ordinary voters to fund.” It is. So, while you are angry, you need to sit back and look at what we need to do and complete as a party. I will be the first to state that having the primary go to the end did not help us with timing. 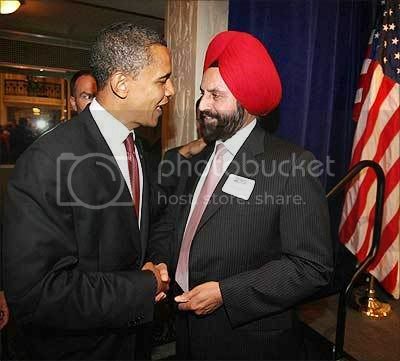 Many just became tired of it and disconnected, well it is time to reconnect and that starts with donating to the Obama for America Campaign. See, I understand the current beef about FISA, warranted and duly noted, but the large picture is too big and the stakes too high to stop now. There are many reading this that have a son or daughter or loved one in Iraq; somebody has lost their job; a family is wondering how to save their home; someone may not have gas money to go to work tomorrow; many are skimping on food because of costs; some teenager is crying right now because they cannot go to college, even though they had good grades; folks got the credit card companies calling constantly because they can’t afford the payments and this list is endless. Yes, endless because I know some people who are affected on this list. So, see FISA right now is not an issue, but change and new direction in this country is. We need to stand together, not apart now. I am hoping this bill is shoved until after November when it can be readdressed, but no matter what happens we need to move forward, together. Folks, we have a laundry list of items to accomplish and time is not on our side. It starts here. Donate to Obama for America. Because if we don’t get him elected in November and increase Democrats in congress, there will be more than whining for the next four years, but some serious weeping as well.